It is said that simply looking at the warped triskelion known as the Yellow Sign, the sigil of Hastur and his avatar, the King in Yellow, is enough to drive one mad. We don’t believe that will happen if you wear this scarf, but we make no promises. 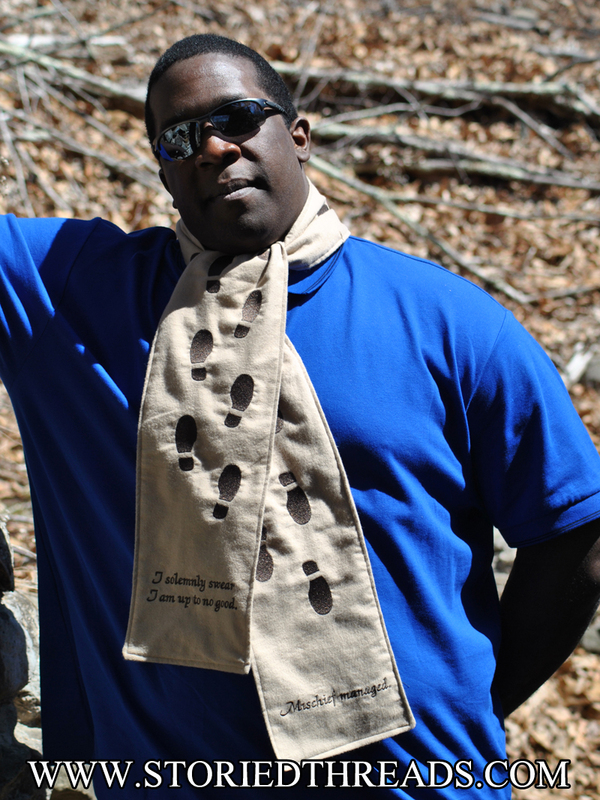 This scarf is made of black cotton flannel, and measures approximately 6 feet long by 7 inches wide. All scarves are double-sided, both for extra warmth and for a neat finish to the embroidery. 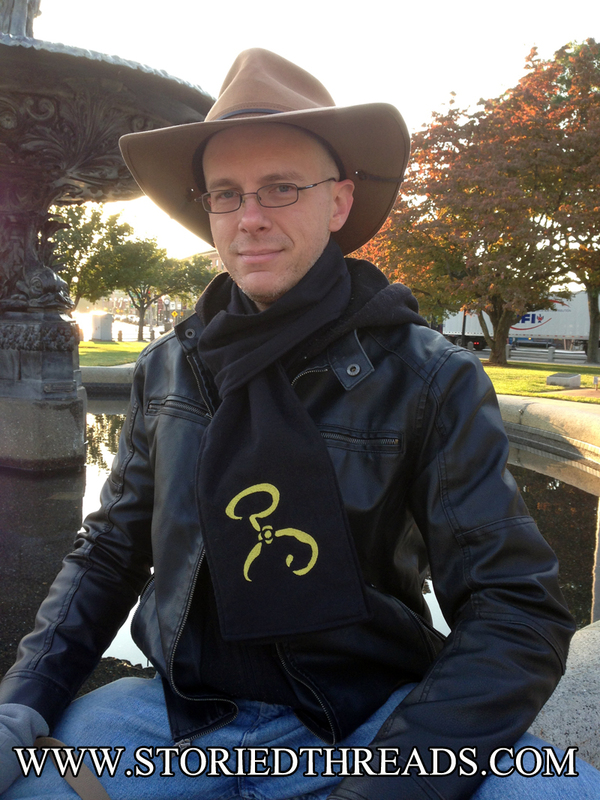 This scarf is available both on our website, and in our Etsy store. Ooh, child, things are gonna get easier. Ooh, child, things’ll get brighter. What amd I doing? I’m distracting you! This sew-on patch depicts a minimalist style rendering of Star-Lord Peter Quill stitched on off-white cotton canvas, and measures approximately 4.7″ tall by 3.2″ wide. 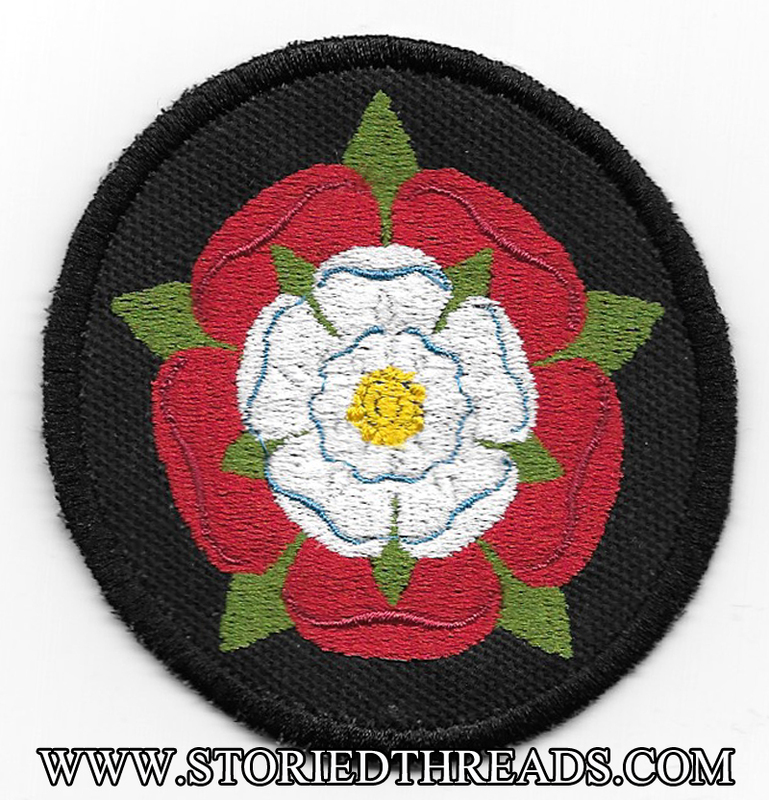 We will have two of these patches available this weekend at the Connecticut Renaissance Faire, or you can order one off of our website. The Eye of Ra, representing both the sun and the feminine aspects of Ra himself, is one of the most well known images in Egyptian symbolism and mythology. 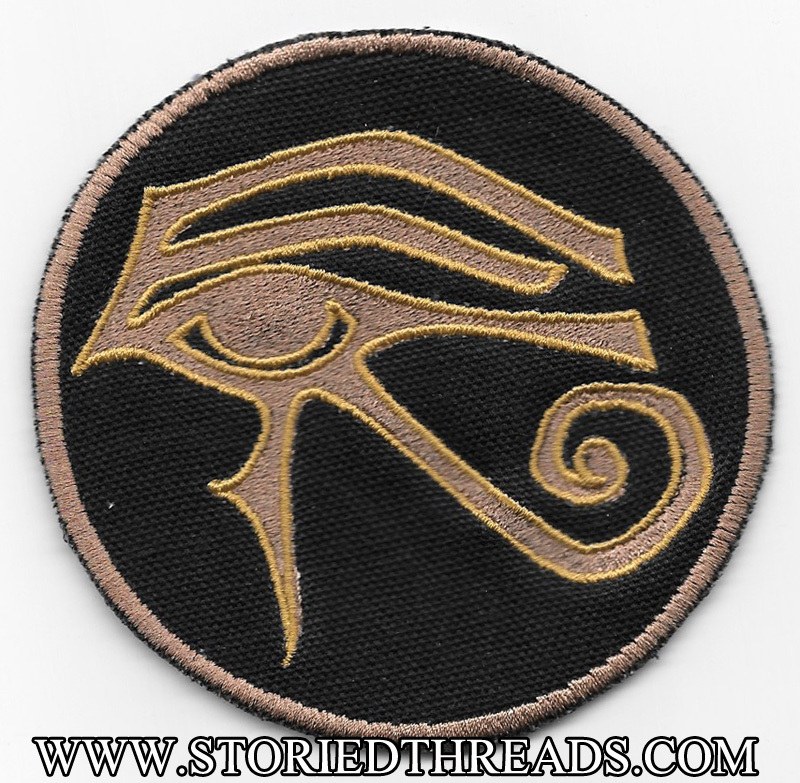 We have stitched it on black cotton canvas in shades of brown and gold reminiscent of the sands of Egypt. This sew-on patch measures approximately 3.75 inches in diameter, and is available both on our website and in our Etsy shop. Apparently, Friday was Hermione Granger’s birthday. Happy birthday, Hermione! Add to that the fact that, for the first time this autumn, I needed to wear a scarf and gloves while walking my dog yesterday morning, and it seemed like the perfect time to spotlight our Marauder’s Map scarf. At one end of this parchment colored scarf are the words, “I solemnly swear I am up to no good.” From there, embroidered foot prints march the entire length of the scarf until they reach the other end, which proclaims, “Mischief managed.” A perfect holiday gift for the Harry Potter fan in your life! The Connecticut Renaissance Faire opens in just one week, which is very exciting for me! It was the first big show I ever vended at, and it continues to be one of my favorites. Not only is it a great show with lots of playful patrons, but I have a lot of friends who work the event in different capacities, and that always makes it feel a little bit like a party at the same time. In honor of CTRF’s Henry VIII themed cast and scenario, I thought it would be a lovely idea to spotlight my Tudor Rose design today. At the moment, it’s available as a patch on my website, and also as a sticker on Redbubble. But I wonder — would there be any interest in Tudor Rose bags or scarves? Because I could make that happen…. 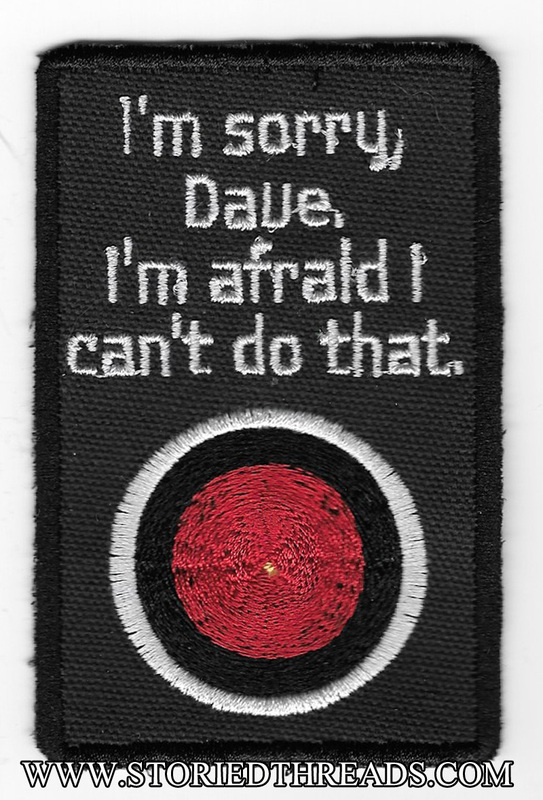 This patch can’t open the pod bay doors for you, and it won’t sing you a song, but it also won’t let you die in the cold vacuum of outer space. What it will do is let everyone know that you’re a fan of Arthur C. Clarke’s classic sci-fi novel and/or Stanley Kubrick’s iconic film adaptation, and thus a highly evolved lifeform (no ebony monoliths necessary). 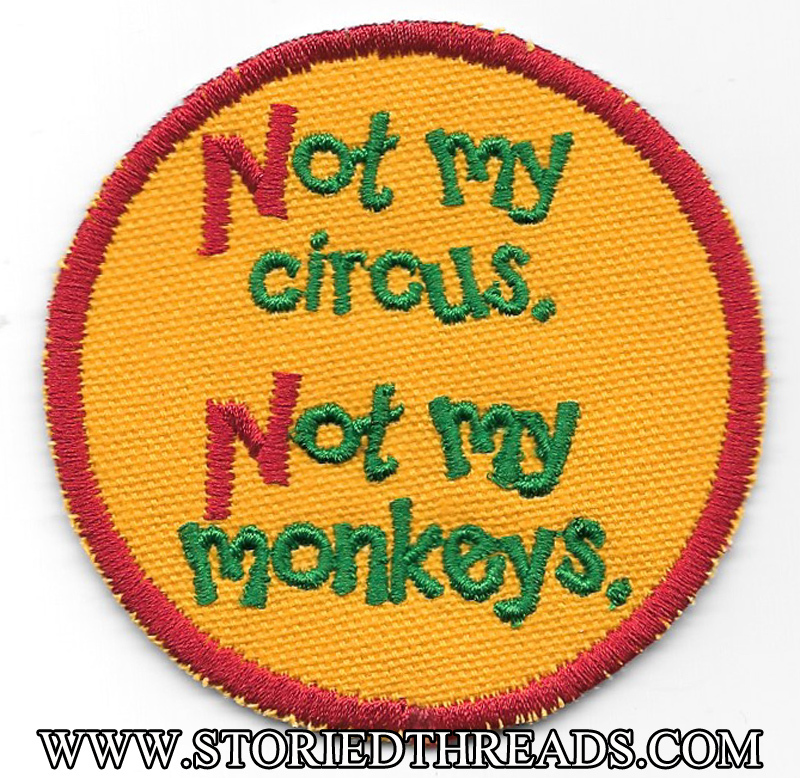 This sew-on patch measures 4″ tall by 2.5″ wide, and is embroidered on a black cotton canvas. 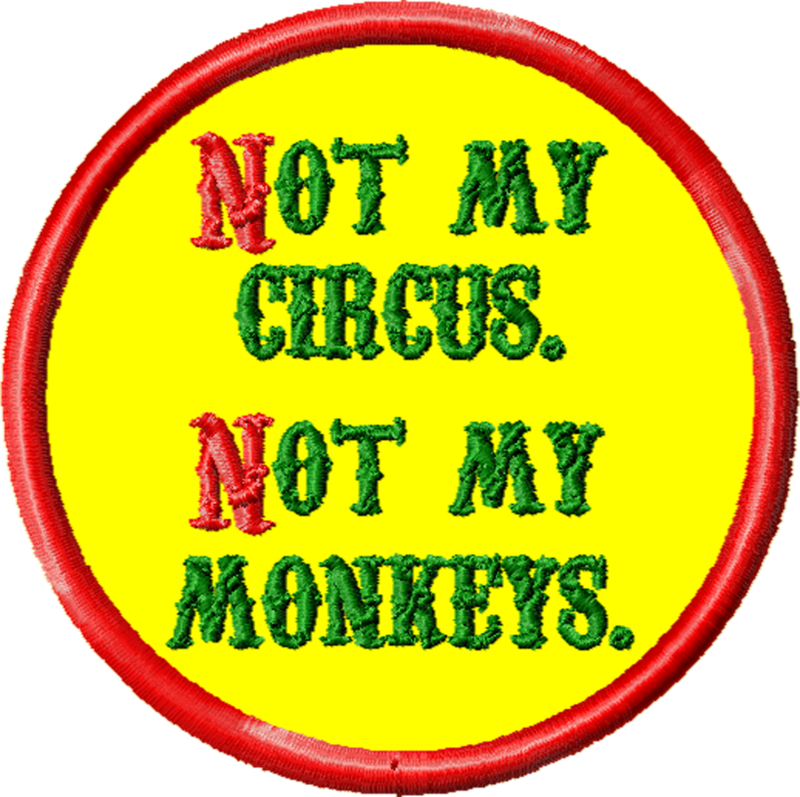 B ack when I first designed my “Not my circus” patch, I knew the font would be important. I wanted something that would give the design a fun, big top kind of feel, and I went hunting for the perfect one. When I saw Carnivalee Freakshow, I knew I had hit upon just the right aesthetic for the design I had in mind. It turned out, however, that this font — while gorgeous in print — did not play nicely with my embroidery software, or my embroidery machine. It stitched in an odd way, creating super-dense letters that didn’t read as clearly as the font promised. In addition, even running at its slowest speed, I was constantly breaking thread, and even ruined more than a few patches by putting holes in the canvas where it had been pulled into the bobbin casing, or simply over-stitched. 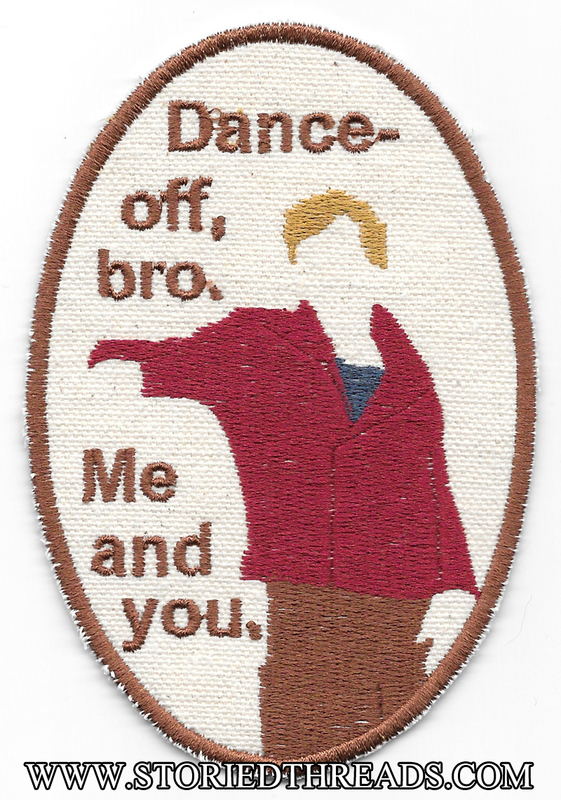 During my last attempted run of the patch, I decided it wasn’t worth being stubborn over — I needed to re-design it. I went font-searching again, and decided to use Happy Sans. While it’s less circus-specific than Freakshow is, it still gives a fun and whimsical feel to the patch. And to be honest — I kind of like it even better than the original. And as an unexpected bonus, using a font that stitches more cleanly actually brings the cost to the customer down significantly, dropping the price on the patch from $9 to $7! It just goes to show that we have to be willing to change our original plans when they don’t work, and that sometimes these changes can improve the product in ways we hadn’t even anticipated. The original design is still available as a sticker on Redbubble — I haven’t decided yet if I’ll change or add the new version. And we have exactly ONE patch left in the old font, which will be for sale at the Connecticut Renaissance Faire for the new $7 price. So if you really love the Carnivalee Freakshow version, you’re not entirely out of luck. But going forward, all new patches will be made with the new and improved design — for less money for you, and fewer headaches for me!